Following their four-game sweep at the hands of the Cardinals, the Dodgers returned home for a three-game series rematch of the 2018 NLCS against the Brewers. Unfortunately, they couldn’t turn their fortunes and the slide continued tonight as the Dodgers pitching struggled yet again in an 8-5 loss. The offense of the Dodgers actually continued to rebound after a rough three-game stretch, putting up five runs on nine hits and three walks against just four strikeouts. All of those runs came on homers. Corey Seager got the party started in the 1st with a solo shot to the opposite field. Cody Bellinger annihilated his 8th dong of the year, a two-run shot in the 3rd to give the Dodgers the lead. 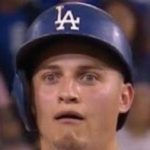 Joc Pederson then smashed a two-run shot in the 4th to give the Dodgers the lead again. It included him seemingly staring down hitting coach Robert Van Scoyoc. Still, they definitely could’ve done more damage at the plate. They failed to score with runners at second and third with one out in the 1st, a runner at second and two outs in the 2nd, and runners at the corners with one out in the 5th. That would haunt them later. Normally five runs should be about enough to notch a victory. However, Julio Urias struggled with his command for his second straight start. While he actually struck out four and only walked one in his five innings, the location was off all night, as evidenced by the six runs (five earned) on six hits and the two homers he allowed. Those homers were particularly rough because they both gave the lead back immediately after the Dodgers had secured them. For whatever reason, the Dodgers decided to go with Joe Kelly in a one-run game with another multi-inning appearance. After a scoreless 6th in which he allowed just a single, he gave up a single and a double for a run in the 7th before being removed with one out. His ERA is now 12.27. Scott Alexander relieved him and allowed a ground-ball single, but got out of a jam with a double play. Dylan Floro took over in the 8th and also gave up a single, but provided a scoreless and drama-free inning. Kenley Jansen then entered to get work as the Dodgers have been losing so much that he hadn’t pitched, but gave up a single, a balk, and a stolen base, before surrendering his first run of the season on a sacrifice fly. Kenley also gave up a walk after that, though he did strike out a pair. He was … unhappy. Surprisingly, the Dodgers got a rally going against Josh Hader in the 8th, getting runners to the corners with one out and the bases loaded with two outs, but Max Muncy and Justin Turner struck out in those situations, respectively. After Hader retired Bellinger in the 9th, he was removed due to being at 38 pitches, so at least he’ll be down tomorrow. It didn’t matter for this game with a three-run lead though, and Alex Wilson closed it out without drama. The Dodgers now fall back to 8-7 on the year, and will have a bullpen game tomorrow against Zach Davies at 3:10 PM HST/6:10 PM PST/9:10 PM EST. Less than ideal.